When the Centers for Medicare & Medicaid Services ("CMS") launched its Medicare Shared Savings Program ("MSSP") in 2012, CMS leveraged the upside, risk only-design and the opportunity to be a care model redesign champion. It also intended to lead the market in value-based care delivery as a way to entice ACOs to join the program. Four years and 539 accepted MSSP ACOs later, CMS released its most recent set of performance results for the 80 percent of ACOs that have survived the program. While savings of more than $429 million and overall quality improvement sounds like cause for celebration, the real story begins by acknowledging that program success doesn’t come easily and requires hard and transformative work…just ask the almost 70 percent (n=272) of MSSP participants who failed to achieve a shared savings distribution. Even for those participants that did achieve program savings, it is likely that the set-up and operating costs associated with the ACO program threatened bottom line financial success…today. But care transformation is not just about today’s bottom line, is it? Program veterans, or those who have participated for more than one Performance Year, have shown that it takes years to truly make an impact on cost and quality. The rest of the story will be written by their continued success as they gain a strategic advantage and encourage other providers to invest in their own transformation. If CMS Isn’t Telling the Whole Story, Define and Measure Your Own Success! Participation in the MSSP is not only an opportunity to impact select quality metrics and recuperate some dollars lost as a result of reduced unnecessary utilization. It is a long-term strategic play to prepare for the not so distant future when up- and down-side risk taking will be the norm, not the exception. The data provided from CMS through the MSSP program is neither real-time nor risk-adjusted, making it extremely difficult for ACOs to assess their performance. In addition, the influx of participants makes it challenging to track and trend an ever-moving target. Furthermore, performance on quality measures is not released to the ACOs until Quarter 2 of the following performance year. This leaves the ACO limited time to review performance, establish initiatives, and implement efforts to improve outcomes. ACOs need to develop a mechanism by which they can continuously monitor overall cost of care and performance on the established quality measures so that they are not relying on CMS to report on their progress. Instead, continuous process improvement and measurement needs to be the new normal in preparation for a time when CMS will not be the only value-based contract in place. The amount of shared savings achieved, the level of patient satisfaction, and the quality outcomes delivered at the end of each Performance Year should not be a surprise, but all too often it is! The Focus On Quality Should Go Beyond MSSP Attributed Lives! The overall quality improvement shown by the MSSP ACOs indicates a program-wide commitment to improved health outcomes that should be applauded. These measures focus on patient satisfaction, reduction in avoidable utilization, preventive care, and evidence-based protocols for at-risk populations. Successful performance on many of these measures requires substantial data aggregation and analysis and proactive outreach to MSSP ACO patients. Where many ACOs falter is by laser-focusing on only the MSSP population; those beneficiaries assigned to the MSSP receive proactive preventative care while other patients are overlooked. While this can be a successful short-term strategy (particularly when resources are limited or information systems have not yet have matured), operationalizing it is a challenge and this approach will not position the organization for long-term success. Quality outcomes initiatives should be inclusive of all patients, regardless of payer, to demonstrate that your model of care can be scaled and to attract similar shared savings arrangements beyond CMS. The bigger problem is that care delivery does not just change for a given population and organizations are realizing that other payers are benefiting from their performance improvement efforts, which causes barriers to engage these providers in value-based contracting because the organization is producing results that are benefiting the payer without the compensation. In 2015, CMS set a goal of having 50 percent of Medicare payments made through alternative payment models by 2018. Providers have responded through strong participation in programs such as MSSP, Pioneer ACO, and Bundled Payments and indications are that value-based payments will become the standard. If your organization embraces a value-based world, then program participation can be a good step towards building the necessary muscle. But only if you make a full organization wide commitment to the cultural change required to support care model redesign and do so with a customized definition of success; because unsuccessful participation may be even more costly to an organization than no participation at all. Organizations who don’t take the time to invest in the appropriate care coordination resources will find that they have spent money on ACO staff, slightly reduced inpatient utilization (and therefore revenue), and receive no shared savings distribution to offset these costs. This can be a very frustrating result, leading to dissatisfaction with the program and disillusionment with care coordination. So, jump in! But don’t leave the necessary people, data, or innovation behind. Mr. McNerney is a manager with GE Healthcare Camden Group. His primary area of focus is bundled payments strategy, design, and implementation. Mr. McNerney also specializes in system and service line strategic planning and new business development for a variety of healthcare organizations. He may be reached at andrew.mcnerney@ge.com. According to a May 2016 survey by the National Association of ACOs ("NAACOS"), more than half—56 percent—of accountable care organizations ("ACOs") in the Medicare Shared Savings Program ("MSSP") indicated they would leave the MSSP program if their ACOs were not eligible for the 5 percent Advanced Alternative Payment Model ("APM") bonus under the Medicare Access and CHIP Reauthorization Act ("MACRA"). A third of the ACOs said they would stay in the MSSP program even if deemed ineligible for the bonus, the NAACOS survey found. The Alternative Payment Model ("APM") is one of two paths for participation in the quality improvement programs included in the MACRA legislation for eligible professionals; the other is the Merit-Based Incentive Payment System ("MIPS"). 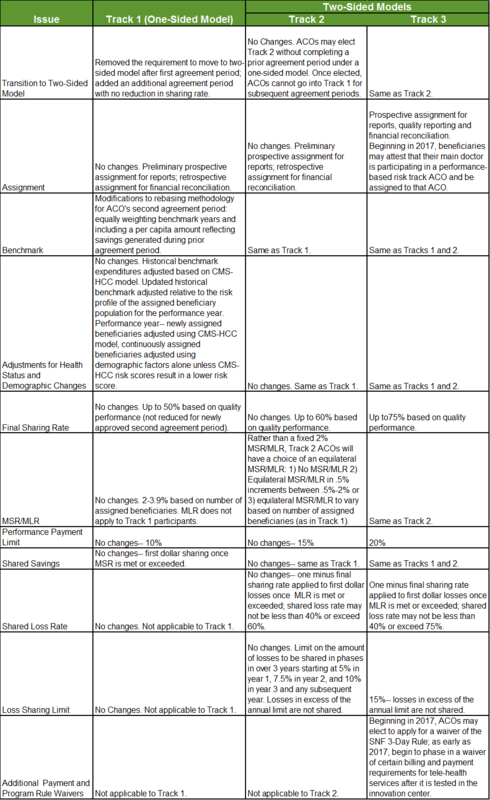 Currently, MSSP Track 1, a one-sided payment model, is not among the models that would qualify for the APM track—which CMS calls "Advanced APMs"—under the proposed MACRA rule; however, the MSSP Tracks 2 and 3, Next Generation, and Pioneer ACO programs, which all require downside risk, would qualify as APMs. Approximately 411 MSSP ACOs, or 95 percent, participate in Track 1 of the program, according to April 2016 data from CMS. All APM qualifying participants will receive a 5 percent lump sum bonus on their Medicare payments for 2019 through 2024. This bonus will be in addition to the incentive paid through existing contracts with the qualified APM (e.g., MSSP) demonstration program, etc. Beginning in 2026, these ACOs will qualify for a 0.75 percent increase in their payments each year. The average total ACO operating costs for all respondents is $1.6 million per year, but the cost difference is significant between single or multi-ACOs, with single ACOs averaging just under $2 million and multi-ACOs averaging almost $1 million per year. If required by CMS to take on downside risk, 43 percent said they would leave the MSSP program and about a third would stay (33 percent). Over three quarters of the ACO respondents (84 percent) said they would be ready for downside risk within the next six years, with 44 percent of those even ready as soon as one to three years. A PDF version of the full report may be downloaded here. CMS recently launched the first step of the application process for its Next Generation ACO (“NGACO”) Model, and next month opens the window to apply for the Medicare Shared Saving Program (“MSSP”) Initiative. The NGACO, CMS’ newest two-sided risk model, accepted 21 organizations for 2016. The MSSP, which also added enhanced risk-based options in 2016, had 100 new ACO participants this year, bringing the total to 434 ACOs at the start of the year. These numbers reinforce CMS’ stated goal to move 30 percent of traditional Medicare fee-for-service payments into alternative value-based payment models by 2016, and 50 percent by 2018. The MSSP Model was introduced in 2012 as a key component of the Medicare delivery system reform initiatives found in the Affordable Care Act and a new approach in the delivery of health care intended to facilitate coordination among providers to improve the quality of care. Among the primary attractions of the MSSP was the option to participate with zero downside risk, meaning if organizations outspent their target expenditures, they would not be liable to repay the difference to CMS. Through Track 1 there existed only upside, or the ability to share in any savings generated, an appeal that the MSSP Model maintains to this day. This allows organizations to dip their toes in the accountable, value-based waters and develop the infrastructure necessary for future success while still participating in a fee-for-service environment today. And the participating organizations have largely voiced their approval of the program – more than two-thirds renewed their participation when their initial agreement ended in December. While the MSSP Model was the right first step for many organizations beginning their journey towards value-based care, it was in many ways insufficient for more advanced organizations experienced in care management and risk-based contracting. Thus the Next Generation ACO model was born, providing a higher-risk, higher-reward alternative to the MSSP, while simultaneously responding to and improving upon its oft-maligned and challenged predecessor, the Pioneer Model, with a refined attribution process and enhanced benchmarking methodologies. Now organizations can select between two risk options from 80 to 85 percent on the shared savings option all the way to a full-risk opportunity. Now if organizations overspend their benchmark expenditures, they will have to cut CMS a check at the end of the year. This may seem daunting, but many organizations view this as the natural programmatic evolution and that the increased skin in the game can be the push their organization might need to really enact the necessary transformation. In fact, seven of the new NGACO participants came from the MSSP program, demonstrating the interest of existing program participants to advance their risk exposure and opportunity based on their work and success to date. The NGACO, with its enhanced risk profile, is obviously not for everyone, which explains why only 21 were accepted in the past cycle. As stated above, the NGACO was effectively developed for those organizations with experience in commercial ACOs or with value-based contracts, or that had experienced success in the MSSP and had outgrown the less-lucrative risk arrangement. Accordingly, in addition to the seven MSSP converts to the NGACO program, eight made the transition from the similarly two-sided, but less favorable Pioneer model. The good news for organizations wanting to prepare for a value-based future is that the 2017 application windows for both programs are upon us. Organizations contemplating their fit in either initiative can apply for one or both, but need to submit their Notice/Letter of Intent by the respective deadlines to be considered. These submissions are non-binding, so we encourage organizations at all considering participation to file one and then assess their options in the next few months. One caveat is that while organizations can simultaneously apply for both models, they will ultimately only be able to participate in one of the two initiatives. With the continuous innovations of both payment and delivery models, CMS is maintaining its commitment to the transformative shift to value-based care. While that momentum is undeniable, not all organizations are necessarily ready for that transition just yet, particularly in the riskier models. We recommend undergoing a comprehensive (and candid) self and market assessment of your organization’s present situation and evolution in what GEHC Camden Group considers the eight core domains essential for clinical transformation to successfully thrive in a value-based world. A commitment must be demonstrated in the below key operational competencies in order to achieve success in the changing landscape. CMS has reiterated its commitment to population health with its ongoing development and support of these accountable initiatives. Even more encouraging, CMS has demonstrated a willingness to adapt and improve to encourage participation and collaboration. The strongest healthcare organizations tend to be the ones that are proactive rather than reactive. For organizations that can see what’s coming down the tracks, there may be no better time than now to begin preparing for a value-based future. On December 1, 2014, the Centers for Medicare and Medicaid Services (“CMS”) published proposed changes to the Medicare Shared Savings Program (“MSSP”) regulations, with the final rule being announced on June 4, 2015. While the timing of the release of the final rule isn’t optimal for those that may have considered participating in the upcoming round of entrants, the final rule further clarifies CMS’ intent to facilitate the movement to value-based payment methodologies. Many of the changes were adopted as proposed, while some others were altered from the proposed changes. Here are highlights of some key changes in the final rule and what it means to accountable care organizations (“ACOs”). Previously, Track 1 ACOs (no downside risk) were limited to one three-year agreement period before converting to a risk-based track. The final rule allows participants to remain in Track 1 for an additional 3-year performance period, or a maximum of two three year periods without the reduced sharing rate that CMS had proposed. This proposal allows those ACOs who have seen modest improvements in their ACO operations and performance and/or those who are not ready for performance-based risk a little more time to implement and execute. The assignment of beneficiaries was historically a two-step process based on provision of primary care services by 1) Primary Care Physicians and 2) Specialists and Advanced Care Practitioners (“ACPs”) (e.g., nurse practitioners, physician assistants and clinical nurse specialists). The final rule revises the process to include ACPs in Step 1 and removes specialties which are unlikely to provide primary care services. This proposal effectively moves the beneficiary assignment toward the provision of primary care and allows the specialists who want to participate in multiple ACOs the flexibility to do so. Further, through rulemaking in the 2017 Physician Fee Schedule, CMS expects to propose that beneficiaries may attest that their main doctor is participating in a performance-based risk track ACO and be assigned to that ACO. Assignment methodology and fluctuations have been a pain point for many ACOs. While this may not be a cure, it does work to address many of the concerns. CMS previously shared certain claims data with ACOs only after ACOs had 1) notified their beneficiaries of that data sharing via direct mail or at the time of service and 2) provided them an opportunity to opt out of data sharing. This time-consuming process was onerous for the ACO and its providers and delayed the receipt and review of data which is key to the success of the ACO. It was also confusing for beneficiaries who received letters in the mail and at the point of care. The final rule allows ACO providers to post signs in their facilities with template notification language that will notify beneficiaries of their right to opt out by calling CMS directly. The proposal removes the ACO from the data sharing consent process – a win for current ACOs who have found the beneficiary notification process to be exceedingly burdensome and a distraction from the primary work of population health management. The current methodology based on the ACO’s past performance that CMS uses for setting, updating, and resetting the ACO’s financial benchmark is flawed. It gives increased opportunity to those ACOs with high utilization and costs and inadvertently penalizes those that have already moved to improve quality and manage costs. Additionally, the method gives diminishing returns over time as ACOs succeed in achieving savings year over year. Once the cost curve has reset, there will be little to no savings left to share. CMS sought comment on alternative ways of benchmarking ACOs for shared savings, including options of comparing ACO providers to the spending patterns of non-ACO providers within their region. In the final rule, CMS formalized the process to equally weight the historical benchmark years, as opposed to weighting those years 10% for benchmark year (“BY”) 1, 30 percent for BY2, and 60 percent for BY3 at the start of the second or subsequent agreement period; and indicated intent to commence rulemaking later this year to implement a methodology that would reset ACO benchmarks in part based on trends in regional fee-for-service costs rather than solely on an ACOs’ own recent spending. The consideration of a revised method that can better reflect the underlying health of the population to reset the benchmark is encouraging. A more precise and accurate reflection of the health of the assigned population will further improve patient experience and enhance the value of the care provided while achieving savings for CMS. CMS has finalized the creation of a new Track 3, a performance risk-based model, which will have a higher sharing rate than Tracks 1 or 2 at 75 percent of all savings or losses and would offer prospective assignment of beneficiaries rather than preliminary assignment with retrospective reconciliation. Additionally, CMS modified Track 2 to allow ACOs to choose from a selection of options for setting their minimum savings rate (“MSR”) and minimum loss rate (“MLR”) in an equilateral manner, with either no MSR/MLR, equilateral MSR/MLR in .5 percent intervals between .5 and 2 percent or equilateral MSR/MLR to vary based on the number of assigned beneficiaries as in Track 1. In the final rule, the new Track 3 will follow the same methodology as Track 2. CMS also indicated its intent to further test the billing and payment requirements for telehealth services via its newly created Next Generation ACO model. It is anticipated that a telehealth waiver may be available to ACOs in the Track 3 model by January 1, 2017. Additional refinements include minor changes to the eligibility for participation in the MSSP, including removal of the requirement that the ACO’s medical director be an ACO provider/supplier; and a more streamlined process for Pioneer ACOs to apply for program participation, among others. While it remains to be seen if the proposed changes will encourage more provider organizations to join the MSSP, it is clear that CMS is creating various models to fit the needs of different types of organizations. Determining which model is appropriate considering the unique characteristics of your organization will be key to success. Remind Me Again...What's the Difference Between an ACO and a PCMH? The Patient-Centered Medical Home ("PCMH") model was proposed by the American Academy of Family Physicians, American Academy of Pediatrics, American College of Physicians, and American Osteopathic Association in 2007. It is, in essence, an enhanced primary care delivery model that strives to achieve better access, coordination of care, prevention, quality, and safety within the primary care practice, and to create a strong partnership between the patient and primary care physician. Like accountable care organizations ("ACOs"), the medical home model is referenced many times in the current Affordable Care Act as one way to improve health outcomes through care coordination. Medical homes are similar to ACOs in that they consolidate multiple levels of care for patients. However, medical homes take the approach of having the primary physician lead the care delivery “team.” Quite simply, an ACO consists of many coordinated practices while a medical home is a single practice. Designation of a personal physician – each patient has an ongoing relationship with a personal physician trained to provide first contact, continuous and comprehensive care. Also, the personal physician leads a team of individuals at the practice level who collectively take responsibility for the ongoing care of patients. Whole person orientation – care is organized around providing services for all of the individual’s health care needs. The medical home takes responsibility for appropriately arranging care with other qualified professionals on an as needed basis. Care coordination and integration – care across the spectrum of specialists, hospitals, home health agencies, and nursing homes is coordinated with the personal physician leading the effort. Evidence and outcomes focus – the quality and safety of care are assured by a care planning process using evidence-based medicine, clinical decision-support tools, performance measurement and active participation of patients in decision-making. Enhanced access to care – practices are “open” in the sense that scheduling is available to individuals, hours of practice are expanded hours and new communications options are deployed for the convenience of individuals seeking care. Comprehensive payment model – payments for services for individuals enrolled in the patient-centered medical home reflect a comprehensive payment for services that extends beyond the face-to-face visit with the personal physician. The ACO is also based around a strong primary care core. But ACOs are comprised of many "medical homes"—in other words, many primary care providers and/or practices that work together. Some have even dubbed ACOs the "medical village." An ACO is basically a network of medical homes. It is a collaboration of different organizations and practices working together which may include primary care physicians, specialists, hospitals, providers, payers, etc. The ACOs take medical homes a step further in emphasizing the alignment of incentives and accountability for providers across the continuum of care. There is a need for very strong leadership to address cultural, legal, and resource related barriers when creating an ACO. The difference is that ACOs would be accountable for the cost and quality of care both within and outside of the primary care relationship. As such, ACOs must include specialists and hospitals in order to be able to control costs and improve health outcomes across the entire care continuum. ACOs by nature would be larger than a single medical home or physician’s office. There are many known benefits of the ACO structure over the medical home model, including the ability to better manage the care for a greater population of people with a larger budget. Being able to use the dollars across a wider range of patients and conditions allows for better overall cost management, less variation within the population, and the ability to track and trend for quality. The recent announcement by the Centers for Medicare and Medicaid Services (“CMS”) of the implementation of the Next Generation (“NG”) ACO model further solidifies the government’s intention to expediently transition to more value-based reimbursement methodologies. The release of the NG ACO model coupled with the clear direction from the Department of Health and Human Services (“HHS”) that it has established the goal and framework to increase payments tied to quality or value through alternative payment models to 30 percent of traditional Medicare payments by the end of 2016, and 50 percent of payments to models such as ACOs or bundled payments by the end of 2018 sends a strong message to providers that value-based payments and increasing risk-based structures are rapidly evolving. It is increasingly important that healthcare providers not only assess their readiness for the new models, but understand the different characteristics of each and determine the best fit for their organization. Whether or not an organization chooses to participate in the currently available models, the key to success is conducting a well-informed assessment of whether to participate, when to participate, and which model is best suited for the organization. Likewise, organizations that are already participating should assess their Medicare strategy on an ongoing basis. As mentioned and as shown in Figure 1, CMS has issued fairly aggressive goals for transitioning to value-based payment methodologies, which have been further supported by the announcement of the NG ACO model. Simultaneously, the overall impact of the Affordable Care Act (“ACA”) has incentivized more efficient care delivery, changed payment methodologies and generally put pressure on hospital operating margins. Hospitals and health systems that historically and largely still today rely on fee-for-service reimbursement face an ongoing quandary of protecting volume to maintain revenues versus transitioning to value-based models where the focus is the right care, at the right time and right place with increased overall value. 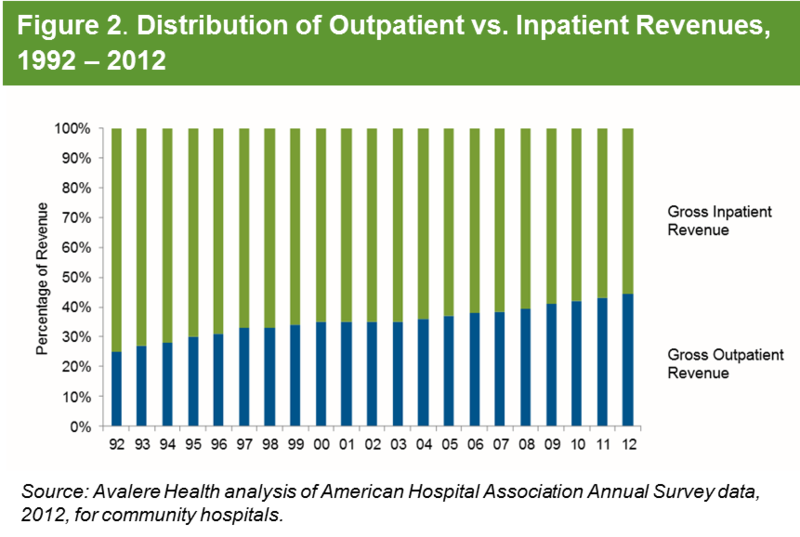 While hospitals and other healthcare providers are impacted differently, the broad impact is a shift from inpatient to outpatient services (shown in Figure 2) and significant consolidation of the market (shown in Figure 3). Clearly, the healthcare delivery system is changing and aligning to provide more coordinated care; and regardless of the market in which a healthcare provider operates, pressure for change is palpable. When determining whether or not to participate in one of the Medicare ACO models; or for those that are already participating and assessing their future direction, organizations need to determine how rapidly their market is changing, the implications of the model characteristics, the size of the fee-for-service Medicare market vs Medicare Advantage, their experience with managing risk, the degree to which they are already taking steps to redesign their care models, the strength of their provider network across the continuum, the size of their patient base, and the difference in financial incentives across models as well as the degree of risk aversion or acceptance for the organization. There are benefits and pitfalls to each of the Medicare ACO models, and the proposed changes to the Medicare Shared Savings Program (“MSSP”) together with the NG ACO structure show that CMS is taking provider experience and comments into consideration as revisions to existing and frameworks of new models are being developed. 58 MSSP ACOs held spending $705 million below their targets and earned performance payments of more than $315 million as their share of program savings. One ACO in Track 2 overspent its target by $10 million and owed shared losses of $4 million. 60 ACOs reduced health costs compared to their benchmark, but did not qualify for shared savings, as they did not meet the minimum savings threshold. Pioneer ACOs generated estimated total model savings of over $96 million and at the same time qualified for shared savings payments of $68 million. According to the Brookings Institution, 13 Pioneer ACOs reduced costs enough to qualify for shared savings, with an average of $5.85 million returned to the ACOs, ranging from $1million to $14million. One ACO owed shared losses of $2.55 million. The remaining 18 ACOs were within the minimum savings or loss rate and did not earn shared savings or owe money to Medicare due to losses. However, CMS is making changes to the programs to make them more attractive and to encourage a greater degree of risk taking. Specifically, the proposed rule for MSSP seeks to address the flawed methodology that is used for setting, updating, and resetting an ACO’s benchmark that currently is based on historical performance and introduces a third track with increased risk sharing, among other changes. And, the NG ACO offers increased risk and reward along with a revised benchmarking methodology. Thus, at a time when market dynamics are changing rapidly, and CMS continues to fine tune the structure of the ACO programs, timing of the participation decision is extremely important. Healthcare provider groups and organizations should explore the Medicare ACO models and the implications of each structure to their individual organization and the ramifications of the changes in programs, regardless of whether they are making the decision to participate or deciding whether to change models. Staying ahead of the changes and timing the decision so as to best support the organization’s goals and objectives is recommended. Organizations considering the choice of Medicare ACO models should assess the individual characteristics and capabilities of their organization, the market in which they operate, and the structure, risks and opportunities under the available Medicare ACO models. One of the main considerations for most organizations is the degree to which they are at risk and the extent of sharing in savings. Table 1 depicts a summary of the models available under MSSP and NG ACO. While increasing focus is being placed on migration to risk as evidenced by the proposed Track 3 under MSSP and the introduction of NG ACO, many provider organizations continue to participate in the Track 1 of MSSP (no downside risk). If revisions to the MSSP program are implemented (as currently proposed), the model may become even more attractive to organizations that have previously opted not to participate but aren’t prepared to take on the level of risk required in NG ACO. On the other hand, the NG ACO model provides an alternative to those organizations that are more advanced in their population health model and ability to manage risk, whether that be organizations currently participating in the Pioneer or MSSP ACO programs, or organizations that have previously not participated. If the Track 3 option is indeed added to MSSP, there will be a range of risk sharing from 40 percent to 100 percent across the models, with a variety of structural characteristics that should also be considered. With the rising demand from government and commercial payers, employers, and the general public to improve the value of healthcare delivery, provider organizations must continually review their readiness to transition to these new models as well as the appropriate structure to support their ongoing success. Having a detailed plan and projecting overall impact to the organization is critical as is timing of decision-making and implementation. The decision is no longer simply whether or not to participate in Medicare ACOs, but rather, as the system evolves, when should providers engage in or change models and which model will lead to the best outcomes. Making the right decision for the organization is imperative. The list below, compiled from CMS' Medicare Shared Savings Program ACO Performance Year 1 dataset, shows the top 10 ACOs ranked by earned payments. Each ACO started its program agreement in 2012 and earned its performance payments by providing complete and accurate reporting for all quality measures. Earned shared savings equal 50% of the ACO's generated savings (minus an adjustment for sequestration). The information reflects totals as of October 2014. A proposed rule issued by CMS this past Monday, December 1, aims to encourage additional participation in the MSSP by reducing provider risk. The proposal, which is open to public comment until Feb. 6, states: "As shown in our impact analysis, we expect the proposed changes to result in a significant increase in total shared savings, while shared losses would decrease." Just as was seen in the MSSP Year 1 results, there is continued need for cooperation among various silos of healthcare and continued transformational efforts. The Pioneer, MSSP ACO, other Medicare/Medicaid initiatives and the multitude of various other independent initiatives continue to provide learning opportunities in relation to the core competencies needed for population health management. However, all of these initiatives have room for variability of the breadth/reach of involvement. The Transforming Clinical Practices Initiative (TCPI) announced by CMS several weeks ago appears to be designed as the next step in the evolution to total population health management. Just as the initiative states it “is designed to help clinicians achieve large-scale health transformation.” From all appearances, successful applicants will have already learned the basics of population health management, be engaged in their own organization, and be ready to mentor and engage others as well. On the surface this initiative seems to incentivize those successful organizations to begin branching out and becoming more inclusive; not only of other physicians, but of other support organizations available in healthcare delivery. It does seem quite clear that this initiative is placing a focus on learning to work together and leveraging our strengths for overall success. You may download a PDF presentation which summarizes the overall TCPI initiative and provides key details for the two separate funding opportunities: Practice Transformation Network (PTN) and Support and Alignment Network (SAN). Health Directions is pleased to announce the addition of Mishka Glaser, CISA, Managing Associate, to the Health Directions team. As a key strategist in the Population Health Management Solutions Group, Mishka leads the implementation of clinical integration, accountable care and other innovation strategies for the firm’s clients. "Mishka's wealth of strategic insight and experience in the field of population health brings an exciting new dimension to our Population Health practice area," says Daniel J. Marino, Health Directions President/CEO. "Her in-depth knowledge of value-based care operations provides the context for assisting our clients in navigating their population health journey." Mishka brings over 15 years of experience in various sectors of healthcare—from physician practices to insurance and pharmaceuticals. Her past positions include IT Audit Manager at Sparrow Health System, Project Manager for a Statewide HIE project at Michigan Public Health Institute, Project Manager at Roche Pharmaceuticals, Territory Sales Representative with Aventis Pharmaceuticals, Program Manager Life Operations and Process Improvement at Blue Shield of California. Prior to joining Health Directions, Mishka served as the Director of Implementation Services for Collaborative Health Systems in Houston, Texas, working with over 30 Medicare Shared Savings Program Accountable Care Organizations across the US. She holds memberships in the Health Information Management Systems Society (HIMSS) where she is serving a two-year term as a member of the Quality, Cost, and Safety Committee; the Information Systems Audit and Control Association (ISACA); and the Healthcare Financial Management Association (HFMA). Mishka earned a Bachelor of Science in Business Administration (Accounting Information Systems) from Central Michigan University and a Masters of Diplomacy and International Relations (Global Health and Foreign Policy) from Seton Hall University. Please join us in welcoming Mishka to the Health Directions team! To download a PDF version of Mishka's latest article, MSSP Year 1 Results – New Surprises or Business as Usual? please click on the button below (no form required). The National Association of ACOs (NAACOS) announced new results to its ACO Tracking Survey. Their report provides updates to the likelihood of ACOs staying in the Medicare Shared Saving Program and the ongoing operational costs of ACOs. The results from the October 2014 survey show that two out of three (66%) MSSP ACOs are highly unlikely or somewhat unlikely to remain in the ACO Program. An additional 26% are undecided. 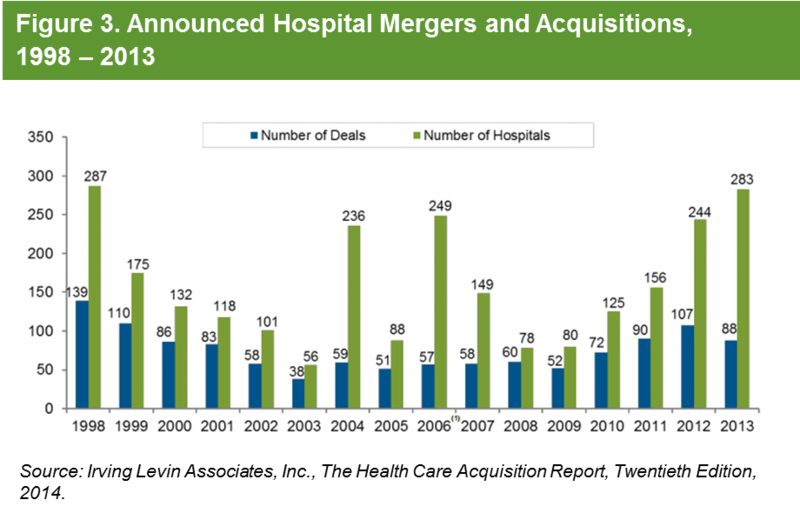 This resulted in only 8% of ACOs being likely to sign a second contract and 92% either unlikely or undecided. NAACOS President, Clif Gaus, commented "This continues to be the most troubling aspect of the Medicare Shared Savings Program and must be sufficiently addressed in the upcoming CMS proposed rules or the MSSP will no longer exist and the high hopes of DC policy-makers to migrate ACOs to capitation and two-sided risk will be impossible." NAACOS continues to be concerned about the significant investment ACOs are making to sustain their operations. They define those management costs to include, administration, data, compliance, and care coordination costs among others that would not otherwise have been incurred. These did not include costs prior to the operation of their first or current performance year. ACO respondents reported an annual mean of $1.5 million management costs directly attributable to ACO operations. A previous survey included a higher percent of first year ACOs and that estimate was $2.0 million. When operating costs for the two and half years of the MSSP are totaled, Medicare ACOs have spent over $900 million for care coordination and other operational costs. On October 31st, CMS finalized changes to the Medicare Shared Savings Program (MSSP) quality measures and benchmarks. While the National Association of ACOs is pleased CMS responded to several ACO provider concerns, the NAACOS believes that changing 25% of the measures is too disruptive and costly for the ACOs and do little to better inform the consumer. Further, while CMS will modestly take into account year-over-year increase in each quality measure, the quality measurement system in total will exclusively reduce the savings earned by the ACOs and provide no positive reward for improving the quality of healthcare to Medicare beneficiaries. Instead of a system of rewards and penalties, CMS has chosen to apply the "stick" only approach to ACOs. If the first year of ACO quality measures had counted in calculating Performance Year 1 savings, not one of the 52 ACOs earning shared savings would have retained all of their savings and the total savings going to the ACOs would have been reduced by 25%. In sum, NAACOS believes CMS failed to strike an adequate balance between changes to the MSSP measure set itself and reforms the agency is making to performance benchmarking. NAACOS President Clif Gaus said, "While CMS has made modest improvement to the ACO Quality Benchmarking, it is still a punitive program that will only lead to future reductions in savings paid to the ACOs who have worked hard to achieve those savings. Coupled with the many attribution and financial benchmarking defects, the Medicare Shared Savings Program is not sustainable in its current configuration and will decelerate the pathway to accountable care for Medicare Beneficiaries." For additional information on the Survey results, please access the NAACOS Member Newsletter at https://www.naacos.com/pdf/Newsletter110314.pdf.